Five compact townhouses with superior quality indoor and outdoor spaces are positioned on a site close to the ocean. The regional code limits the building height to two-storeys only, however to achieve ocean views the third-storey was essential. 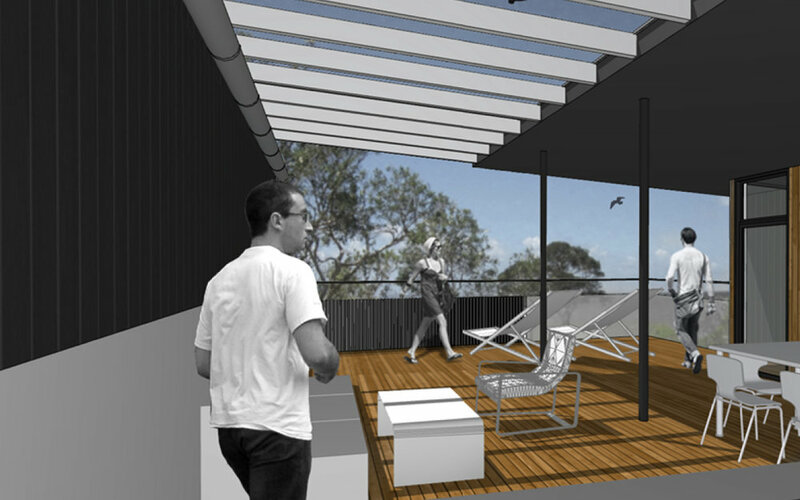 A thorough research of the town planning regulations led to a creative approach and innovative design, which allows the inclusion of covered roof top terraces, offering stunning views of the ocean. All town houses have an open-plan design for the living areas located on the first floor and comprise adjoining east-facing decks to allow elevated views. The master bedrooms provide contemporary living with en-suite bathroom, private outdoor areas and separation from secondary bedrooms. Each townhouse differs in design features and offers a slight uniqueness thus providing variety for the developer while concurrently taking advantage of the site.